Being designed with wider toe space and moderate opening width, avoid pressing against feet and heel slipping. The best choice for martial arts,kung fu,Tai chi,hip-hop, parkour, rock,wushu and other fashion young people. 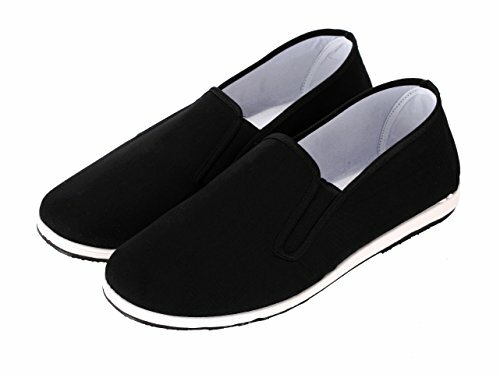 Canvas Top, Anti Slip Rubber Sole, Flexibility and Durability.Suitable for indoor and outdoor use.These kung fu shoes have no irritating semll and are more healthy to feet. Cloth upper,Rubber sole,Cotton lining,Have very soft cotton insole,comfortable to wear.And provide durability and exceptional anti-skid resistance for all martial arts exercising. Chinese traditional shoes,Old Beijing cloth shoes,3000 years of history in China.These kung fu shoes have an attractive appearance with Chinese traditional slip-on kung fu style. 100% Money Back Guarantee: If the size don't fit you or any other problems for you don't like the shoes, Do not worry and please feel free to contact us at any time, we will make refund for you. The best choice for martial arts,kung fu,Tai chi,hip-hop, parkour, rock,wushu and other fashion young people.